Tata, the transnational Indian conglomerate whose Tetley Group makes the world famous Tetley teas, has taken 6,500 people hostage through hunger. The hostages are nearly 1,000 tea plantation workers and their families on the Nowera Nuddy Tea Estate in West Bengal, India. Permanently living on the edge of hunger, the workers and their dependants are being pushed to the edge of starvation through an extended lock out which has deprived them of wages for all but two days since the beginning of August. The goal of this collective punishment is to starve the workers into renouncing their elementary human rights, including the right to protest extreme abuse and exploitation. The hostage-taking began with a first lockout on August 10, when workers protested the abusive treatment of a 22 year-old tea garden worker who was denied maternity leave and forced to continue work as a tea plucker despite being 8 months pregnant. On August 9, Mrs Arti Oraon collapsed in the field and was brought to the hospital, on a tractor normally used for garbage, after the medical officer refused to make an ambulance available (he had proposed she be brought by bicycle). She was initially refused treatment, and only after her co-workers protested did she receive minimal care. Her treatment was inadequate and she had to be taken, in the same garbage tractor, to the local government hospital one hour away. As news of her treatment spread, some 500 mostly female estate workers gathered in protest at the medical facility, demanding sanctions against the medical officer. Local management promised to meet with the workers, but on August 11 the management, along with the medical officer, left the estate and declared a lockout. On August 27 an agreement was signed with three trade unions, representing some workers on the estate but not a majority, on reopening the garden. In the agreement, all workers’ wages for the lockout period were withheld. The agreement included a clause that a “domestic inquiry” (an internal, company-controlled investigation) would be conducted. The agreement was written in English, a language few if any of the workers understand. The garden was reopened the following day, although workers were not informed of the conditions of the reopening. On September 8, management issued letters of suspension and ordered a domestic inquiry against eight workers. None of the eight workers received a letter of notification. None of the eight had committed any act of violence or were involved in any illegal practice. These eight workers have been targeted because they are active in the garden campaigning for workers’ rights. At a September 10 meeting, management told the workers that suspension letters had been issued in accordance with the August 27 agreement and that opening the garden depended on compliance with that agreement. In other words: agree to the suspensions or you’ll be locked-out again. Workers requested six days to respond to this ultimatum. The ultimatum was a powerful one: tea garden wages are just 62.50 Indian rupees per day – the equivalent of USD 1.35 daily. One kilogram of the cheapest, poorest quality rice in the local market costs 20% of a worker’s daily wage. Tea workers permanently live on the edge of hunger. The loss of wages for even a few weeks can tip them into starvation. Although wielding the weapon of hunger – with workers’ lives in the balance and the deadline to respond not yet expired – management on September 14 again left the plantation and implemented a lockout. This was the day workers were meant to receive their annual festival bonus, amounting to roughly two months wages. No bonus payments were made. Prior to the lockout, since the beginning of August workers have only received a wage payment amounting to two days work. Following the closure, workers have sought to communicate with the management, requesting it to reopen the garden. The company has insisted that the garden will not be reopened and wages paid unless all workers accept the September 10 ultimatum to effectively sign off their right to protest abuses. Tata Tea is a powerful global company; it’s wholly owned Tetley Tea is one of the world’s biggest-selling tea brands. 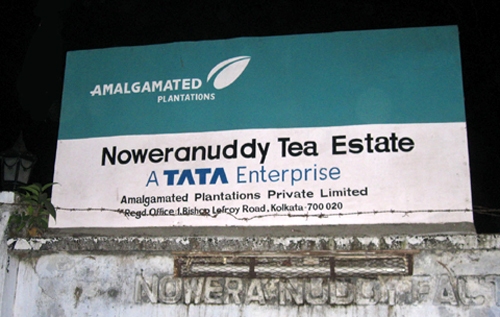 Nowera Nuddy Tea Estate is owned by Amalgamated Plantations Private Limited, a company 49.98% owned by Tata Tea. Tata and Amalgamated share the same office in Kolkata, the capital of West Bengal. According to the Tata Tea 2009 annual report, Tata Tea Managing Director Percy T. Siganporia earns in a single day roughly 1,000 times the daily wage of a Nowera Nuddy worker – assuming that worker is paid . Tea from Amalgamated Plantations’ tea estates goes into the famous Tetley Tea bags. Tetley Tea is a member of the Ethical Tea Partnership (ETP), whose standard commits member companies to, among other requirements, ensure that there is no “harsh or inhumane treatment” of plantation workers and that “Workers should be paid at least monthly and should receive their pay on time.” The actual conditions on the Nowera Nuddy estate, where workers are being subjected to brutal collective punishment, could not be more remote from this CSR wish list. Workers at the Nowera Nuddy Tea Estate have formed an Action Committee which has called for the immediate reopening of the garden, the withdrawal of the suspension letters and no recriminations against workers, back payment of wages and rations since 14 September, immediate payment of the annual festival bonus and a management apology to Mrs Arti Oraon. You can support their struggle – CLICK HERE to tell Tata and Tetley Tea to stop starving workers now! You can also use the features provided on the Tetley Tea website to send the company a message, or use the freephone number provided to give them a call!